Almost all materials are colored in some way, either by dyeing, printing, painting, or other methods. It is argued that color is among the top factors influencing consumers’ decision in material purchases. Color perception, however, is a personal experience and a significant part of our visual experiences are based on our color perceptions. 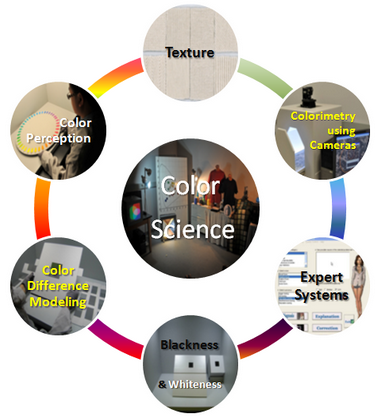 An aim of the study of color science is to enhance our current understanding of human color perception, and this is often based on psychophysical assessments of colored objects and lights. Color science comprises the study of human color perception, as well as specification, quantification and reproduction of color by means of dyeing, printing, and through electronic media including television and photography. As a result individuals responsible for design and color selection, those dealing with production and quality control, and others responsible for the retail or purchase of colored material can establish an objective means of communication, avoid delays, maximize efficiency and improve consumer satisfaction. Clearly color science entails so many disciplines of learning from physiology, and psychology to mathematics, chemistry and physics that adequate understanding of the topic requires collaboration with a multidisciplinary team of researchers. Among studies currently in progress in the field of color science are the examination of color difference models with a view to improving the performance of existing models and developing more effective models, determination and understanding of unique hues, developing visual and instrumental methodology for the assessment of complex colored patterns, color constancy, and examination of variations in color difference perception due to age, gender and experience. For a more specific list of projects please visit faculty pages listed.